If you follow my posts, then you know that I am a pretty crunchy mom. When it comes to my life, and my children’s especially, I try to use the best products available. There are so many chemicals surrounding us on a daily basis, so I try to limit chemicals and artificial ingredients that we put into our bodies specifically. I found essential oils when BK#1 was little. You can read about Tummy Gize and how I use it here. I also use oils for teething, you can read about that here. Last year, I found a blend that works wonders for our family’s allergies. I have some pretty rough seasonal allergies, my husband has seasonal allergies and some specific allergies, and our littles definitely inherited them unfortunately. Thankfully, right now, it just seems like the babies have seasonal allergies. Their pediatrician prescribed some over the counter allergy medication. They didn’t really help, so she then prescribed prescription strength medicine. After some time, I didn’t see much of a change in symptoms even though my one year old was taking medication every single day. I consulted with our pediatrician and we decided to start exploring some natural remedies for their allergies before extensive allergy testing and medications. I started diffusing a blend of peppermint, lavender, and lemon and saw immediate results. Not only were the results immediate, but they were continuous. They are still working. Any time the kids are having any allergy symptoms, I diffuse the blend and their sniffles subside within minutes. As an adult, I not only notice my runny nose and sniffles disappear, but my sinuses are clear! If you have allergies, you know how amazing this feels. I have done the research and tested multiple other brands. Young Living is the best quality and works the best. You can find many different brands at many different price points for your budget. But like most things, you get what you pay for. It is just that simple. Always dilute with a carrier oil (like coconut) for little ones. Apply to base of neck. Apply to bottom of feet and put on socks. I apply Lavender alone on my cheekbones and bridge of my nose for sinus pressure relief. You can also make a roller ball using equal parts of each oil for travel and to have the oil already mixed on hand. I diffuse for the kids 95% of the time. Fill diffuser to fill line with water then add 5 drops Lavender, 4 drops Lemon, and 3 drops Peppermint. I put the diffuser in whatever room we are in and it runs for around 6 hours before I need to refill. Depending on the severity of their symptoms, I diffuse 24/7 or just in the morning when they wake with sniffles. Add 1 drop of each oil to 1 teaspoon of local honey for children. For adults, use 2-3 drops of each oil. It is an oil, so it will be a little rough on the pallet. Just use a chaser like a glass of water. Always be safe with your oils. Especially with peppermint. Peppermint is one of the most effective essential oils for respiratory infections and congestion, but it can be dangerous for young children. It can slow breathing, so be sure to always use a safe diluted amount. There are many different opinions and ages that are suggested. Some say don’t use under age 3, some say it’s safe as long as it’s diluted. Our pediatrician said that she felt it was safe if heavily diluted or diffused. I don’t apply blends with peppermint to my little ones, but there is plenty of research saying that if applied safely, it is okay to use. I just worry so much as it is, so I completely avoid applying it since diffusing the blend works so perfectly already. Please read more about oil safety here. Fall is my favorite season, but our bodies don’t like the weather changes as much as I do. I am so glad to have found a natural solution! I hope this blend helps you as much as it helps my family. Family Vacation. What is “vacation”?!?! Okay, so we have the first part down. Definitely away from home and business, but definitely not the last few words,”relax”? Not sure I have even figured out what that is yet! You see, as a parent your “work” never goes away. You are always a mommy and a daddy. No matter how much help (in the form of other competent adults to watch your tiny humans) you bring with you, your children ultimately want you and need you! We have been at the beach down south for 5 days now and my expectation for what our first vacation as a family of four would be has changed drastically! TODDLERS DO NOT LIKE CHANGE. My tiny humans are so confused and out of their element. We are in a huge house with a large portion of our family. They don’t know which way is up, or how to get anywhere. It’s a long walk to get to their snacks and up to their toys in their room. How frustrated would you be if you had no idea where anything was? We are trying as hard as we can to make it feel like home, but that’s pretty impossible in a house double the size of ours. It’s light out way past their bedtime. Falling asleep has been extremely hard, and they aren’t sleeping through the night because of various unpredictable noises. Thankfully, I am a morning person and I don’t mind getting up at five, but I’m sure the entire house doesn’t want to get up at the arse crack of dawn to go for a walk. The up side is I have seen more beach sun rises than ever before! TODDLERS AND HEAT AREN’T FRIENDS. Life is definitely good, but your typical vacation habits are just a dream. Babies get hot quickly and then the tantrums start much more easily than they otherwise would. We only spent an hour or two outside at a time for the first few days of vacation. It is a completely different heat than they are used to in Ohio. TODDLERS ARE A LOT OF WORK. TODDLERS SENSE RELAXATION LIKE ANIMALS SENSE FEAR. We worked in shifts, attempting to be able to just sit and soak up the sun. It never failed that once one of us settled down in our chair that both children would start screeching like they were dying. Grandparent moved out of sight. Wrong parent is holding the baby. Daddy covered his foot with sand. He is dying because said foot is now gone. The best one of all, both toddlers get up and go. In different directions. So, you run to the rescue of whoever was attempting to watch two toddlers alone. NO ONE ELSE SPEAKS YOUR TODDLER’S LANGUAGE. Like I said before, we have a ton of family with us that give us breaks from time to time. Adult: I know you were trying to relax, but I have no clue what she is asking for and now she wont stop crying! Me: Okay, bring her out here. BK#1: mommmaaa oooseie in yewwooo tup!!! Me: Good grief kiddo, take a deep breath and tell that to her without fussing. BK#1: Juice in yellow cup? Two year olds are funny fickle little things! Don’t feel bad if you don’t know what they are saying 80% of the time. There are days I just stare at her like she is an alien because the things she is saying definitely doesn’t follow a language on earth. We are having a blast on vacation and you should definitely make it happen for your family if you can! Thankfully, all my children will remember are the hours floating in the ocean and lots of alone time with mom and dad, but man oh man, next year I will definitely be going with much lower standards of what family vacation is with young children! Keep a lookout for more on our family vacation. Tips, tricks, lists, products and how we turned chaos into fun! We embarked upon a 12 hour, multi-state drive with my parents this past week. I really thought I had prepared for everything. Beach cabana for baby, travel DVD player, toys, blah blah blah. And let me tell you, no amount of prepping for this trip could actually PREPARE my mind. Don’t bring extra of everything. Bring enough to get you there, and then go to the grocery store for any food, diapers, wipes, etc. Same for the trip back: take what you need. 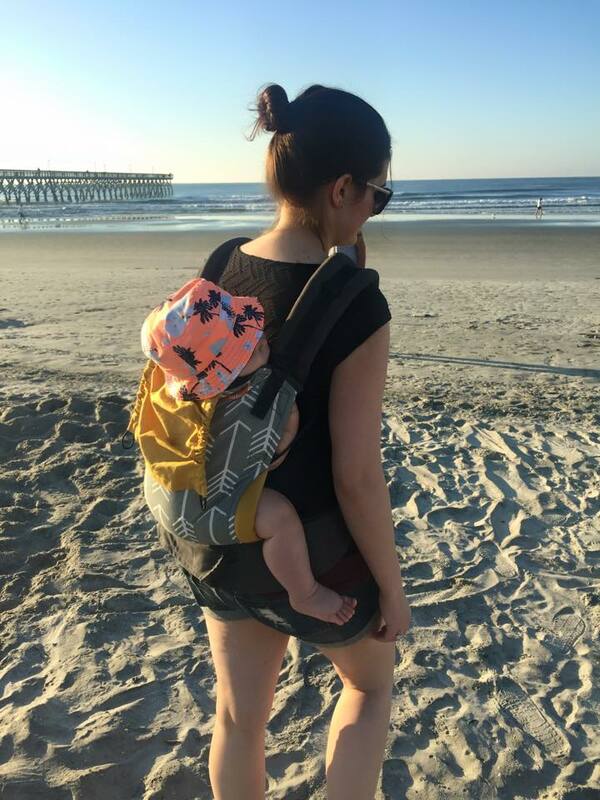 Plan trips where you can use your stroller. If your LO is like mine, they love being carted around and seeing new things. We took our little umbrella stroller, and it was perfect. Malls, aquariums, places where you can move freely. When going to restaurants: go to places that are loud. Your LOs giggles, grumbles, and cries will be masked and others won’t be irritated with you. Also, bring a few toys, sanitary wipes to clean the high chair and table, and their food (my LO ate puffs often to keep him entertained.) Let them play with things at the table– our LO was entertained forever by a crumbly napkin. I was now a survivor. I prepared myself for the trip home. I learned from my mistakes. This momma was NOT going to lose her sanity again. We left a day early. This gave us two days at home to just get back into our “element” before having to go back to work. Best decision we made. Sure, we lost out on a day’s worth of condo rent… but totally worth it. We left at 8:30 AM. LO was fed, diapered, and in a good mood. I kept the atmosphere calm the entire trip. This helped not to get him super worked up, just to be stuck in his car seat for 10 more hours. We sat in the farthest back seat, where I could be right next to him. Toys. Just a few toys that are good for travel. Nothing to big that will be a hazard if a wreck should happen. We avoided the portable DVD player and just had some constant, steady music going. When he got tired, I wrapped him in a blanket and gave him his binkie. He slept much more the trip back than the trip down. All-in-all: our trip down was infinitely more successful. No stress, and our LO did great. I know you want to look good. Especially if you plan on date nights. BUT, take my word on this… find ways to just look casual and cute, or you’ll end up looking Like Suzanne Somers after a sweaty episode on Dancing with the Stars. Your LO will interrupt your beauty routine, and you’ll have makeup everywhere and end up half dressed. I took a few casual summer dresses, which worked out great. I twisted my hair into “mom buns” so that later in the day my hair would have some natural wave to it. Keep the makeup simple. Less is more. Take advantage of the time your LO is sleeping to do what you need to do for yourself. Several onesies, for approximately 2 outfit changes per day. A sweater for cold weather. 2 pairs of shorts. 2 pairs of pants. Socks. 1 pair of shoes. 2 pairs of pajamas. Bath supplies: wash, powder, lotion. Diaper ointment. Nail clippers. A few small bath toys. Quilted pack n’ play sheet. Food necessities: Travel spoons (I like Plum Organic’s) Bib that can be wiped off, any bottles or breastfeeding supplies. Take your own formula! 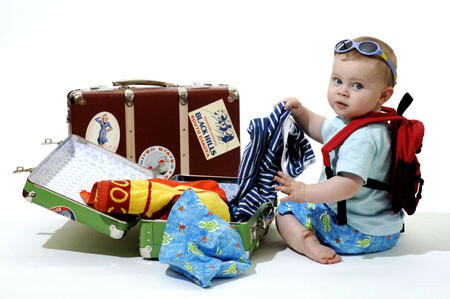 And if you prefer organic food for your baby, research your options prior to travel. We found plenty of organic supplies while on vacation. Medications. Tylenol, saline, Advil, gas drops. Our LO was teething, and we ended up using Tylenol several times. Video monitor. Our LO went to bed before we did, so this was great to keep an eye on him, and didn’t take up much space in our luggage. Beach: Cabana or umbrella, sunscreen, swim diapers, hat, portable fan. Best of luck, travelling parents! May the force be with you.